The Army branch is the main branch of TAW and contains most of the membership. This branch focuses on all gaming for TAW. The Army branch has two senior leaders responsible for the entirety of Army, the Army Commander and Army Lieutenant Commander. Reporting to these leaders are a number of Corps Commanders and Lieutenant Corps Commanders. These leaders supervise the TAW Corps. 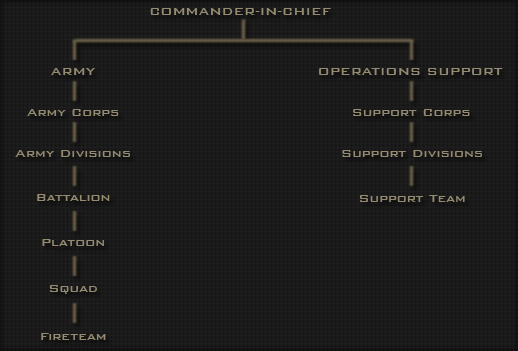 Each Corps contains a number of divisions, which are the individual gaming units of TAW. 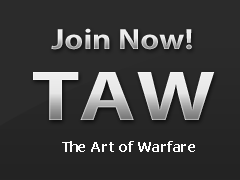 If you join TAW, you will become a member of an Army division. The Operations Support branch is the smaller of the two TAW branches. This branch focuses on all of the support activities for TAW. Operations Support manages the TAW.net website, Teamspeak, Treasury and coordinates all other activities that help the day-to-day running of TAW. The Operations Support branch has two senior leaders responsible for the entirety of Operations Support called the Support Commander and Support Lieutenant Commander. A common misunderstanding within TAW is what exactly the chain of command is and how it works. So, what is it? A chain of command is just that, a chain of commanders who oversee everyone under them in the chain. Not every leadership position is directly part of the chain of command, however, which is a common misconception. For example, a Head Drill Instructor oversees the drill instructor office, but they only have temporary command over them given by the chain of command and TAW policy so they can make sure a drill instructor is doing their job correctly and that onboarding is taken care of. If a drill instructor or even a Head Drill Instructor were to have an issue with someone in their battalion (not related to their job) they would need to report it to their chain of command, which starts with their Squad Leader (when applicable). Note: Sometimes the very first chain in the chain of command can be different depending on the division you're in. Some divisions do not use squads or Squad Leaders and many do not use Platoon Leaders despite platoons being guaranteed in any division. In the event that might be true for your current division, you should still approach the first chain that is applicable to you. If there is no Squad Leader, you approach your Platoon Leader. If you're missing both, you then have to jump to your Commanding Officer. When trying to get a issue taken care of by someone in your chain of command, you should always include whoever is part of that commander's office. For example, should you need to talk to your Division Commander about an issue, you should also include the Division Officer because they support each other and often discuss a situation together. While the DC has the final say in ever circumstance, often the DO will be given the power by the DC to handle certain issues themselves.